I HAVE NEVER stepped foot in India, but I once attended an Indian-American wedding in which my friend’s bridesmaids walked down the aisle in colorful saris that would put a fashionable Western bridal shop to shame. Colors. When I first began thinking about this issue on India, that’s what immediately came to mind—brilliantly decorated elephants, vibrant paint smeared on foreheads, ochre robes, and, of course, a rainbow of saris. It’s a typical Western stereotype I've inherited. But as I ventured into unfamiliar terrain in order to edit Issue 87 of Christian History & Biography, I couldn’t get colors out of my mind. Especially after I learned that the thousands of castes in India are divided into four “colors"—white, red, yellow, and black. And the lowest of the low, the “untouchables” and aboriginals, are marked as outcaste by being denied the dignity of a color class. They are the “colorless,” the unseen. 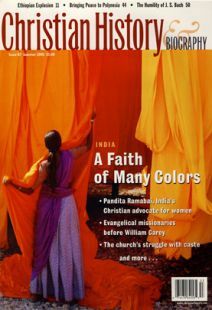 I also discovered quickly that the kaleidoscope of traditions, people, movements, and unique cultural challenges that make up Indian Christianity defies the limited palette of our magazine pages. And so we have chosen to offer you a range of case studies. Apart from a few stories of pioneers like Bartholomaeus Ziegenbalg, most are snapshots gathered from a transformative period in India’s history when nationalists were protesting British rule, Indian intellectuals were responding to the ideas and challenges of Western culture, the idea of “Hinduism” as a world religion was beginning to take shape, Indian Christians were leading conversion movements, and converts were struggling with what it means to be both Christian and Indian. We've set apart an entire five-page section in the center of this issue to orient you to the places and peoples of India—here you’ll find a map, a timeline, an explanation of the caste system, and a brief glossary. I encourage you to familiarize yourself with this section first and to keep your finger there as you read the other articles, to refer to when needed. Why should Western Christians care about India? As Andrew Walls, Lamin Sanneh, Philip Jenkins, and others have pointed out, the center of gravity for Christianity is shifting from the West to Africa, Asia, and Latin America. It is more important than ever to understand the history of Christianity in these parts of the world. These non-Western Christians ask different questions of the faith than we have asked, see the gospel through different eyes—and yet the commonalities affirm the unique power of Christianity to transcend ethnic and cultural barriers. Indian Christians’ struggles with the caste system may shed light on our own culture’s struggles with ethnic prejudice. Indian Christians, like ourselves, have had to think and live out their faith in the midst of a pluralistic environment and to walk a fine line between pulling away in isolation or losing the uniqueness of the gospel by accommodation. There is much we can learn from them. One final word: This issue would have been impossible without our consulting scholar, Dr. Robert Eric Frykenberg, who has given generously of his time and his world-class expertise in order to help us bring you the most accurate and engaging portrait of Indian Christianity possible. It is indeed a many-colored faith.